This is Vegas, baby. Nothing is boring or ordinary. If you're coming to Vegas to get married, or if you're here and happen to be in the mood, then why go for something you could get anywhere? We're the city of Elvis, of mobsters, of Harleys being ridden right into the chapel! Pick your theme. Paint the town whatever shade you like. And make your wedding exceptional with these Vegas theme wedding ideas. If it was good enough for the King himself, it's great for all of us. When Elvis and Priscilla tied the knot at the old Aladdin in 1967, they set the stage for decades of Elvis themed weddings. Now that the Aladdin is Planet Hollywood Resort & Casino, it's no surprise the hotel has its Elvis package ready and waiting. At Planet Hollywood, and all across Las Vegas, you can get hitched and serenaded, by any number or style of Evli. Las Vegas is the Elvis impersonators' natural habitat. And for the most part we let them roam free. But the ones that perform weddings are a special breed. Some pick up the happy couples in limos. A few have been known to roll in on four-seater bicycles. But whichever you choose, it's a safe bet that you'll get to hear Elvis' signature songs. For a tropical affair, the Viva Las Vegas Chapel has a wedding dedicated to the King and covered in memorabilia, sets, and props from Elvis' iconic Hawaiian adventures. They've even got a Priscilla impersonator. And the A Las Vegas Wedding Chapel offers an "Aloha Las Vegas" package where Elvis and hula girls sing and dance four songs. You can even get an hour's performance from Elvis at your reception. Get married or renew your vows at Cupid's Wedding Chapel. An Elvis impersonator will perform the ceremony, entertain you with three songs and pose for photographs. Ever pretended you're a long lost kid of the King? We dream of that all the time. At the Silver Bell Wedding Chapel, you can indulge in the fantasy by having Elvis walk you down the aisle. He'll even leave you with a satin scarf and songs you won't soon forget. Not to shatter the illusion, but it would be pretty hard to get married by the real Elvis. We believe in Vegas magic, but that might be a little much. So impersonators like Jesse Garon of Elvis Las Vegas are the next best thing to a séance. Garon has been marrying couples in various chapels since 1992. He's appeared on "The Tonight Show," "Regis and Kelly," "HBO," "E!," and more. He sings and dances for wedding parties. And he's even been known to take visitors for rides down the Strip in his pink Cadillac. And, of course, there's the Graceland Chapel. They started it all 25 years ago as the first chapel to specialize in Elvis themed weddings. Have an impersonator entertain you at your wedding or perform renewal ceremonies by signing up for the appropriately, or inappropriately, named King's Package. What companies offer these ceremonies /services: Planet Hollywood Hotel Chapel, Silver Bell Wedding Chapel, Viva Las Vegas Wedding Chapel, Graceland Wedding Chapel, A Las Vegas Wedding Chapel, Cupid's Wedding Chapel, A Hollywood Wedding Chapel, Shalimar Wedding Chapel, Elvis of Las Vegas. For more information on these chapels, visit the Vegas.com guide to wedding chapels. We can think of a few reasons you might want a drive-thru wedding. Some are sweet, passionate and romantic, and others are a little naughty. But the drive-thru wedding craze actually began as a way for disabled people to get married at the Little White Wedding Chapel without having to get out of their cars. Since the '90s, it's turned into one of those uniquely Vegas endeavors that allows anyone to roll through the Tunnel of Love Drive-Thru and take the plunge in the comfort of their own vehicle. Bouquets, boutonnieres, photos and DVDs of the ceremony are available. And for an added fee, you can drive a bright pink Cadillac and have an Elvis waiting at the chapel window. What companies offer these ceremonies /services: The Little White Wedding Chapel. For more information, click here. Your wedding is an excuse to "Shout it Out Loud"! So think guitar picks instead of rose petals, smoke effects instead of candlelight, and a Gene Simmons impersonator instead of a priest. Your KISS wedding is guaranteed to be "Hotter Than Hell." What companies offer these ceremonies /services: KISS by Monster Mini Golf. For more information, click here. Yeah. You read that right. You can get married, knock out a Grand Slam, then get something to eat at Denny's. (See what we did there?) 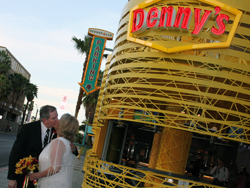 The 64,000-square-foot restaurant on Fremont Street is the first Denny's in the world with weddings on its menu. Any time, day or night, you can score some pancakes, tie the knot and, thanks to the full-service bar, tie one on. The cake is even made of Denny's Pancake Puppies! What companies offer these ceremonies /services: Denny's at Neonopolis. Find out more about it here. This may be Sin City, but we've still got an eye for romance. Our very own Paris Las Vegas is a fitting tribute to the romance capital of the world. Ride the elevator to the outdoor observation deck on the 50th story of the Eiffel Tower and wed your beloved overlooking the real city of lights. Live music by a guitarist or pianist, suite package, photography, spa passes and full video recording from the ride up to the ride down are all available to make your romantic day eternal. What companies offer these ceremonies /services: Paris Las Vegas. For more information on packages, services and office hours click here. You can actually order a wedding delivery! It may not be quite as expected as the special guest at the bachelor or bachelorette party, but it might leave you just as excited. Call up the Las Vegas Wedding Wagon for a wedding, renewal or commitment ceremony. Prices start at just $129 and packages include minister, photos and even a witness. Call the team up to your hotel room or meet them in front of the Fountains at Bellagio or the Welcome to Las Vegas sign. The planners do their best to accommodate whatever fun, unique locales you can think of. Just remember that you still have to have a valid Clark County marriage license ($60) before the ceremony. What companies offer these ceremonies /services: Las Vegas Wedding Wagon. For more information, click here. O sole mio… sta ‘nfronte a te! What's more romantic than a gondola ride down the Venetian canals? And what's more Vegas than making all the Grand Canal Shops customers jealous as you clutch your bouquet and pose for a picture, all while being serenaded by your gondolier? The Cerimonia Sul'Aqua weddings take place in an authentic Italian gondola large enough for the bride, groom, witness and minister. Perfetto! What companies offer these ceremonies /services: The Venetian hotel-casino, Lake Las Vegas. For more information on The Venetian's wedding packages and services, click here. For more than 50 years, "Welcome to Las Vegas" has been prominently displayed on a sign, even as the city has grown around it. Now an icon of Las Vegas history, and on the National Register of Historic Places, the "Welcome to Las Vegas" sign provides a classic backdrop for your big day. Ask your wedding planner or hotel concierge how to arrange a ceremony. What companies offer these ceremonies /services: Multiple locations, including The Las Vegas Wedding Company. You want your marriage to last forever, or at least longer than some other Vegas pairings. To inspire a lifetime of wedded bliss, why not surround yourself with more than 150 historic signs that have stood the test of time? The Neon Museum and Boneyard boasts nearly two acres of vintage signs that prove Vegas may change, but the spirit remains the same. What companies offer these ceremonies /services: The Neon Museum and Boneyard. There's a reason getting married is called taking the plunge – it may just leave you wet and gasping for breath. But if you want a more literal interpretation, the 117,000-gallon Silverton Aquarium is the place. Make your friends jealous by having mermaids as your bridesmaids. And make your partner a little nervous with 4,000 sharks, stingrays, and tropical fish as your witnesses. Plus, the hotel throws in one-night accommodations, officiate services, photos, DJ, rehearsal dinner and reception (all on dry land) as part of the package. Just remember that you have to be scuba certified first! What companies offer these ceremonies /services: The Silverton. We know you're going to get lucky on your wedding night. So why not pick a night that feels lucky already? Memorable dates like 07-07-07 and 10-10-10 have been big nights for weddings in Vegas because they give that little extra magic to the experience. And the anniversaries are easier to recall, for those forgetful types. So when you're planning your wedding, pay attention to the date. You may just get lucky more than once. What companies offer these ceremonies /services: Typically, all hotel chapels and free-standing chapels in town offer packages. Get married on top with wedding services on the High Roller (or as locals like to refer to it, that big wheel on The Strip). Nothing says 'I do' like showcasing your love for one another on the largest observation wheel on the planet. That would be 550 feet in the air - to be exact. As the High Roller slowly ascends to the top, you spend a whole 30 minutes with the rando you met last night. Nothing screams Vegas like a same-night wedding. What companies offer these ceremonies /services: A Wedding Chapel in Las Vegas.